Deemed as one of the ideal solutions for comfortable standing and sitting at the computer, Geekdesk V3 exhibits exceptional features that can give your mundane office desk a superb revamp. 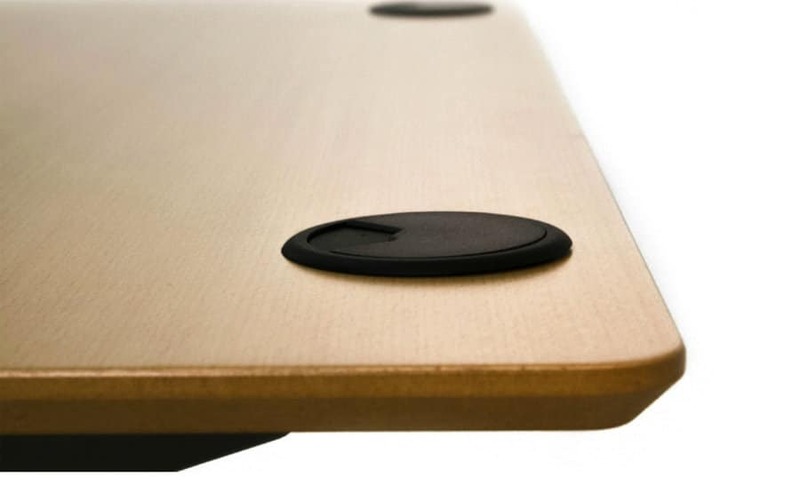 The stability, intuitive height control, and the large tabletop took the spotlight and most users find these features the most impressive from this product. Sifting through more of the product specs, the Geekdesk V3 boasts a large top with a maximum width of 78.75” and hence, is one of the bigger desks on our standing desk comparison chart. Although the Geekdesk V3 falls into the vast lineup standing desks with mid-range prices, it still has a few downsides to consider, the warranty coverage is on the ok-to-lower end, and adjustment speed falls also in the ok-to-slower category compared to other desks. Also, the fact that it has no memory presets on the control pad is a little disappointing. If you want to learn more about its function and advantages, we’re happy to give you a full view of what the Geekdesk V3 can offer. Articles for you: we have researched and classified our list of the best standing desks, or if you’re not really sure what to buy, maybe take a look at the standing desk buyer’s guide first. Stability and frame construction are two of the most important features of a standing desk, and the Geekdesk V3 does not fall short on these aspects. Equipped with a crossbar, the stability is considered great by most users, both laterally and front-to-back. Although some manufacturers have forgone the concept of cross supports to stay aligned to the modern minimalist design, Geekdesk V3 has retained the use of cross support to reinforce the stability without compromising the sophisticated and ergonomic design. If you are interested in a desk without the crossbar, then an interesting desk to take a look at is the Fully Jarvis. The frame is made from durable steel and manufactured in China, and it creates a solid base for your desktop. Given the impressive width of this desk, a maximum of 78.75”, having a strong base is important. This sturdy frame, as well as the motors, is what gives the GeekDesk v3 a lifting capacity of 275 lbs. Although not as much as the staggering 400 lbs that the StandDesk Pro can handle, but still more than many desks like the ApexDesk Flex or even the more expensive Varidesk ProDesk 60 electric standing desk. Without proper storage, cables and wirings will forever be a complete eyesore. But GeekDesk has cable management trays to organize and hide the cables in this v3 unit and conceal it all right under the table top. Not to mention the grommet holes available on large and medium tops for cable routing. Not only does this clever feature promote better and neat cable storage but also improves the minimalist design. Be sure to note, however, that the cable management tray is just an add-on that you can purchase separately and is not included with the desk. In addition, the holes on the cross beam are surprisingly functional that many users took advantage of this seemingly nonessential feature and use it as a mounting port for various accessories. When it comes to the desktop, the finish is spot on. 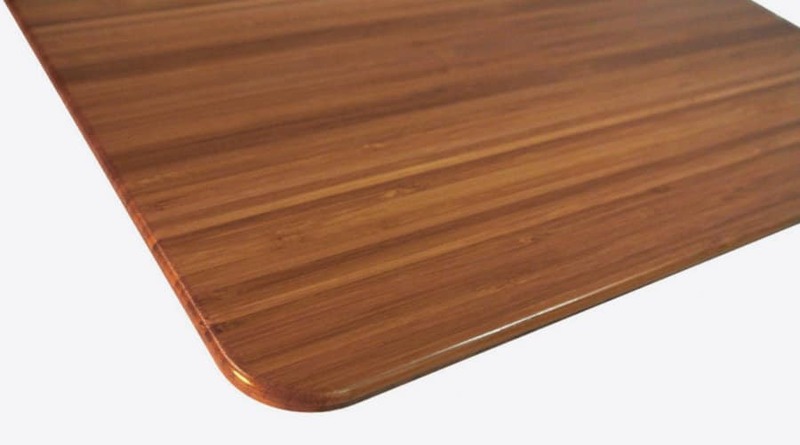 The rounded corners of the table add a refined look and subtle edge. The contemporary and minimalist design and the neutral tones also compliment most office interiors. It exhibits a sophisticated touch and beautiful craftsmanship with the 8 elegant top finish selection- Beech Veneer, Black Laminate, Carbonized Bamboo, Natural Rubberwood, Dark Walnut Rubberwood, Espresso Rubberwood, Golden Oak Rubberwood, and Red Mahogany Rubberwood. You can also match these stunning tops with a silver or black frame. The desktops come with pre-cut grommet holes for better cable management. Whether you take all the desktop space alone or share it with someone, you’ll have just enough room to work on. The top size range from 47.25″ to 78.75″ width and a depth of 31.5″ offers ample surface room where you can comfortably work on a pile of paperwork or frolic in your favorite video games. If you opt for the medium and large size, there’s enough room for two people working side by side. And with the capacity of 275 lbs, you should have adequate weight capacity for your workspace. Ample space, nice finish, and well-rounded and beveled edges. A 10/10 desktop. Many reviews rave about the easy assembly of the GeekDesk. It takes approximately 30 to 45 minutes to set everything up from start to finish. You also won’t need a stash of tools to put the pieces together; a screwdriver is all that you need. Almost everyone can handle the assembly, and if for some reason you can’t then you can grab Geekdesk’s installation service on-site for $95. Probably the only challenge with the installation is the weight of the frame and desktop, so it could be helpful to have a friend help you out. If you really don’t want to have to do any kind of setup, then you should definitely look at the iMovR Lander with its innovative tool-free setup, a very impressive feature. See the video below for how easy it is to set up. 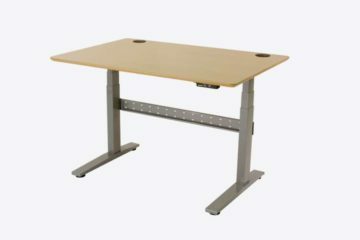 This adjustable height desk can also compete with other premium quality standing desks in terms of noise and motion. As noise output is a concern for many users, GeekDesk v3 needs to keep up with certain brands that offer relatively low noise output such as the Autonomous SmartDesk 2 – Business Edition with only 39 dB. Although GeekDesk v3 can’t quite get as low as 39 dB, it still transitions to different height levels in a silent and smooth motion at under 49 dB. With such a rating, many users applaud its smooth and whisper-quiet operation which doesn’t create noise distraction while working. The smooth and silent operation of the GeekDesk v3 is definitely a great advantage and stands as a worthy competitor against iMovr Lander that operates a bit louder with a noise output of 55 dB and the ApexDesk Elite Series Electric Standing Desk at 66 dB, despite both these desks being more expensive. Neat and organized packaging makes it a whole lot easier for the user to find the parts and put all pieces together in no time. And taking a closer look at GeekDesk v3’s packaging, it’s textbook. Everything is packaged very well and the parts are organized in 3 different boxes. One box carries the essentials such as the large black frame, manual, cords, control box, and the heavy-duty legs engineered with motors. The parts that integrate the frame structure to the table top, the washers, and the screws that are even labeled for quick and easy installation are organized in another box. And the largest box has the desktop inside. Plus, the frames are enclosed in a bubble wrap for added protection. It is important to know that someone would respond and assist you with your concerns whenever you seek customer support and GeekDesk would definitely be right on the other line when you give them a call. Many users on GeekDesk highlighted their superior customer service and this provides a sense of relief for all the other users when they need to address some issues like warranty claims, refunds, replacements, damages, and further assistance. The warranty period or coverage somehow defines the resilience of the product and implies assurance that it is of the topnotch quality. Well, of course, the longer, the better. The GeekDesk v3, however, only offers a 5-year warranty for the steel frame and 2 years for the moving parts and the motor which is similar to what the ApexDesk Elite and other brands offer. It seems decent and might be appealing for some customers but here’s a catch: it does not cover any warranty for the desktop, which is pretty disappointing. Compared this to the high-end standing desk iMovR Lander, it guarantees a lifetime warranty for the frame, 10 years for the electronic parts, and 5 years for the 3D laminated desktop. Even the StandDesk Pro also stands as a tough competition with a similar warranty to the iMovR Lander’s but much cheaper in price. Another slight issue to consider is the lift speed. Some users find the transition a bit slow with only 1.1 inches per second. But the mere fact that the GeekDesk v3 runs smooth and silent when it shifts from one height level to another, it is not much of a big deal for some users. Unlike most modern standing desks, one lacking feature of the GeekDesk v3 is that it doesn’t have a controller with memory presets. The GeekDesk has your typical controller which allows for up/down adjustment, but nothing like many other desks which offer 3 or 4 memory presets, or even the iMovR Lander which has a connected App for adjusting the tabletop. As we mentioned before, GeekDesk was one of the original solutions in the standing desk industry, but it seems like a lack of development and innovation in this area has left it slightly behind the competition. We suggest looking at a desk like the UPDESK Pro which actually includes the controller in the purchase of the desk, not as a paid extra. Despite doing exactly what it needs to do, the controller is slightly outdated compared to the competition which offers Apps and memory presets. There have been inconsistencies in regards to the delivery time. It can be as early as 3 days as what some users had experienced and could be as long as 60 days to 5 weeks. I don’t think this is a huge issue, and I say it as more of a warning to not worry much if the desk is delayed slightly in its delivery. With the market brimming with stunning innovations, picking out the perfect standing desk that best suits your needs can be a tough call. But as we delve into the stunning properties of the high-quality standing desks, GeekDesk v3 is definitely a contender. So with the function, design, and overall quality on the line, how does the GeekDesk v3 stand? Is it worth investing in? Although there have been drawbacks, GeekDesk v3 keeps up with some of the high-end standing desks today and is a versatile standing desk that defines both functionality and design. Despite the subtle issues with the adjustment speed and warranty coverage, and the main issue of no memory controller, it has the essential features that can increase work productivity and promote health benefits that a lot of have found it a worthwhile purchase.